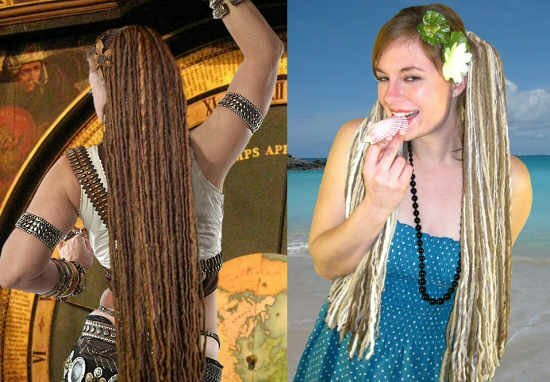 Why the secret of our super lightweight dread falls also means the end of many very popular models very soon! Everything good comes to an end one day, this applies to many of our most popular dread falls with ponytail attachment, now! It's actually two basic materials that are running out, unfortunately. Chestnut dreads and the fairer strands in the dark blonde model, see picture above for reference. But even worse, these dreadlock colors are used as highlights and strands in other color mixes, too, which indeed means that we won't be able to offer these dread falls any longer as well! At the end of this article you find a list with clickable links to each dread fall model with ponytail attachment at the risk of sellout, so you can make sure to get one of the last pieces in case you want to! It's actually an open secret, because it lies in the material we use and naturally we inform you about such basic details of our products! All our dreadlocks are made of special yarns, mostly a wool-synthetics mixture, some yarns are synthetics only which makes some falls vegan dreadlocks (click here for the list of all vegan dread falls in our range). These yarns are usually produced for one season only so we have to act quickly and get as much stock as we can possible store. Most yarns are only offered for about a year, one can feel lucky when one's able to find remainders of stock to purchase later on. As you can already imagine: Even the largest stock comes to an end one day and with such popular models I really start a treasure hunt whenever that happens! For the blondes this has not been my first treasure hunt actually, just one year ago I made an announcement on the Magic Tribal Hair facebook page and in the newsletter that I was very lucky because I had found some more blonde yarns. But now they are coming to an end again. For the chestnut dreads I must admit having stock numbers wrong. The outside of a large storage box said something totally different compared to the real content and the chestnut yarns were not stored in a wrong place either, they are simply almost gone! This was a big shock as you can imagine! So for the past few days I've been running my feet off for these chestnut yarns. The catch is moderate but better than nothing and considering the fact that these yarns were produced 5 or 6 years ago I can really call myself lucky! For you this means there are still some chestnut dread falls and chestnut mixes to get, but they will be sold out, soon. I don't expect finding more than the yarns I could get, now, some are indeed being delivered from abroad already! Temporary availability of appropriate yarns is the reason for our limited edition dreads, too! Before I go ahead and purchase large stocks, I must make a few models to test the yarns. It's that crazy that in some cases the relevant yarns had already almost been sold out in this short period of time! As a consequence I could not order the stock I needed for a larger collection any more. In other cases the very limited stock was clear from the beginning but I could not resist getting these super gorgeous colors for you! This applies to the enchanting henna-mix and the lush rainbow colors in the picture below. 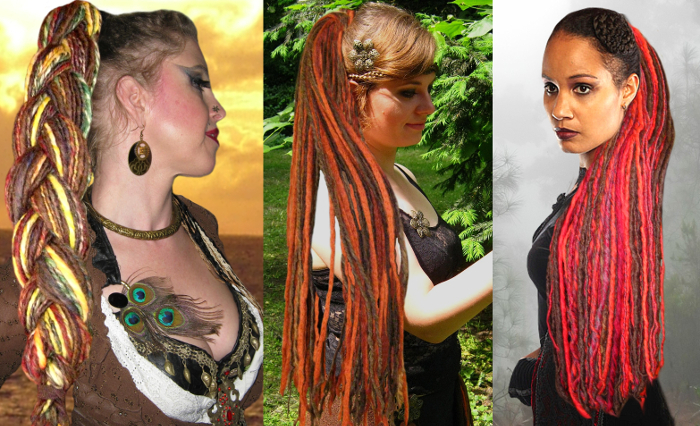 Another digression: Why are yarn dreads so incredibly much lighter than dreads made of hair or hand-felted dreads? Wool and acrylic/ synthetic yarns are lighter per se compared to a strand of hair of the same volume, because less fibre makes more volume. This means we can save a lot of weight this way! For dreadlocks this is especially important because you need way much hair for a dread fall compared to hair falls of open hair of the same volume. You simply need more hair to create these compact strands through backcombing and such. Hand-felted dreads are the same, they are made of the lighter material wool, but in this compact version the dreads gain a lot of weight. What's still available in our shop? Each item in our shop that comes with a quantity available is an item that will sell out, soon. This is not only for dreads, but for all items. The quantity is shown on top of each item description near the "add-to-cart"-button. When the quantity available has sold, we cannot offer this item any more, because we simply have run out of material then. I've just adapted all dread falls, some are not available in all sizes and lengths any more for me to plan better, because the falls are still handmade to order like all items in our shop! You find a list with clickable links to all models selling out at the end of this article. It's mostly the falls with ponytail attachment that will sell out, soon. For clip-in dreads I keep separate stock, the good news here is that these color mixes will luckily be available somewhat longer for clip-in dreads. Clip-in dreadlocks Gipsy Spirit with chestnut strands and clip-ins in chestnut-color only will be available longer than respective color mix with ponytail attachment. This means you are not very much in a hurry to get your favorite clip-in dreads model, now, but for the ones with ponytail attachment you should not wait too long. Click here if you wish to check our clip-in dreads, now! Any questions? Write a comment or mail me at melanie@magictribalhair.com! Hope to see you in my next blog article, too!